This page does not source its references. Please help Libregamewiki by adding in references where required. Click here to edit this page. Uzebox Game Console is a free game. This means that the source code is available to be studied, modified, and distributed. Most projects look for help with testing, documentation, graphics, etc., as well. 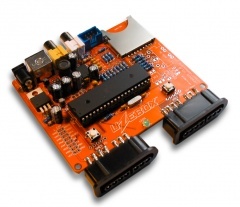 The Uzebox is an open source 8-bit game console design created by Belogic Software. 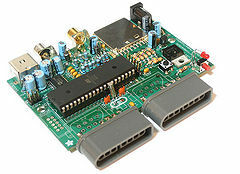 It is based on the Atmel ATmega644 AVR general purpose microcontroller. The particularity of the system is that it has an interrupt driven kernel and no frame buffer. All functions such as video sync generation, tile rendering and music mixing are done by a background task so games can be developed easily in C/C++. Two companies introduced commercial implementations: The Fuzebox and the Uzebox AVCore. Since then, about 50 games and demos ranging from classic arcade ports to original games were released by various developers. 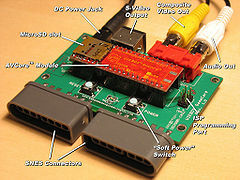 The Uzebox was listed in Make Magazine's definitive open source hardware projects of 2009 . The design goal was to be as simple as possible yet have good enough sound and graphics and leave enough CPU to implement interesting games. Emphasis was put on making it easy and fun to assemble and program for any hobbyists. The final design contains only two chips: an ATmega644 and an AD725 RGB-to-NTSC converter. 5 channels sound engine: The sound subsystem is composed of 3 wavetable channels, 1 noise channel and 1 PCM channel. Retro controllers: The joypad inputs uses standard SNES controllers interface. Emulator: A fully cycle-perfect emulator greatly eases development. Gameloader: An AVR bootloader that loads and flashes games stored on SD cards. Content: Over 90 games and demos plus tools and documentation all created by a dedicated community. 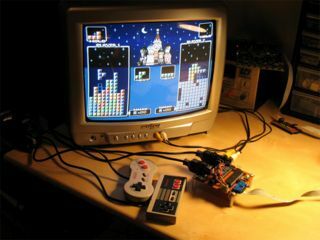 The video is output on one of the 8-bit I/O port as RGB, 3 bits are allocated for the red component, 3 bits for the green and 2 bits for the blue. Those are fed to a DAC composed of three R-2R resistor ladders which in turn feeds an AD725 RGB-to-NTSC converter from Analog Devices. This gives 256 fixed but simultaneous colors on screen. The latest video engine boasts 9 video modes that supports bitmapped and sprites-based modes as well a SD card streaming mode that allows the playback of movies. The highest usable resolution attainable on the console is 360x224. The sound subsystem is composed of 3 wavetable oscillators channels, one LFSR-based noise channel and a PCM channel (to play samples). Each have independent timbre, frequency and volume. Resolution is 8-bit and is mixed at NTSC line rate (~15Khz) and is output on a single pin via pulse width modulation (PWM). A hi-level engine can play specially formatted MIDI files. The engine also support the concept of "patch streams" for music instruments and sound fx. Similar to a MIDI stream of notes, but instead the stream is composed of sound changing parameters. The joypad input uses a standard SNES controller interface. An optional MIDI In interface and driver allows to compose music from any sequencer. All developement is done in AVR Studio, an IDE developed by Atmel. Besides being free and easy to use, it includes a cycle-perfect software simulator for all AVR devices. By adding the free WinAVR GCC package, C development is possible on the AVR platform. A set of tools developed in C and Java help generate content for the game. There is a converter to transform raw images to tiles and maps, a MIDI file converter and a patch/fx editor. Uzem, a fully functional emulator was created to ease development. It supports sound, all graphics modes, integrates a GDB (GNU debugger) server and support the SD card interface and PC joysticks.